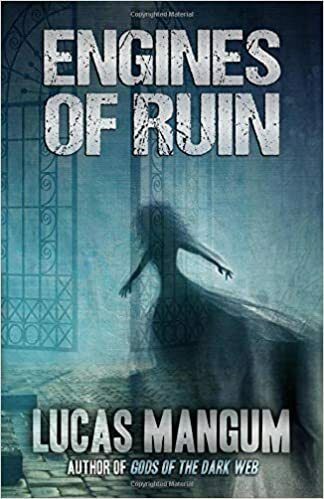 I recently had a conversation with my friend, Lucas Mangum, the author of FLESH AND FIRE, MANIA, ENGINES OF RUIN, GODS OF THE DARK WEB, and WE ARE THE ACCUSED. The collection, Engines of Ruin, was just released in paperback on January 5 (the Kindle edition has been out since December). 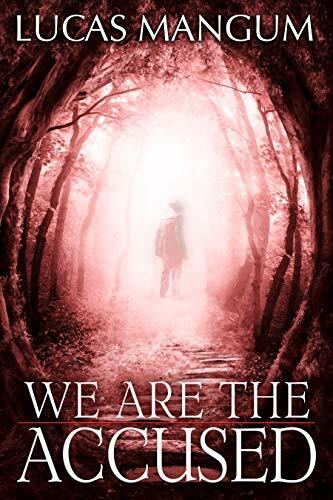 Lucas’ newest novel We Are the Accused was released on January 15th. You can find the rest of his books on Amazon and you can also follow his blog Cranky but Cultured. Lucas, I’m curious to know if there is a book that you can remember—not necessarily the first one you read, but a book that definitely made you cry. I will mention two—I don’t remember if I actually cried but I do remember being deeply affected by first The Island of the Blue Dolphins by Scott O’Dell and also by another called Stepping on the Cracks by Mary Downing Hahn. First, O’Dell’s book I think primarily affected me because of the violence and because it was my first exposure to real tragedy and stuff like that. Stepping on the Cracks was a book that really affected me because it was the first time I really experienced the magic of storytelling, the way she sets things up. There are these expectations early on this book and then she kind of turns them on their head, but it doesn’t happen in a way that makes it seem like it comes out of nowhere. She surprised me, but it makes sense. I’m wondering–I’m not a writer but I’m an actor and a performer and so, I know for me that when I’m doing stage work it definitely energizes me. So I’m wondering if for you the writing practice gives you energy or, when you’re finished writing, are you exhausted? You know, lately it’s been doing nothing but energizing me. It’s weird, but now I want to write more. I don’t know if it’s because I finally like got my voice or hit my stride or whatever you want to call it; it’s been like this for the last 6 months. I’ve been very, very productive always wanting to continue doing things. For example, I started doing this new thing just after I finished another piece. I’m ready to move on to another one and I’ve never done that before; I’m just compelled to do it. So this is the first time that you have felt that type of energy when you finish a project, i.e. you are ready for another. Yeah, before I would get this temporary high, but I would definitely have crashes as well. But this doesn’t feel like that now, it’s different. Your writing obviously crosses over some genres. How did you get to that point? When you started writing, were you attracted to horror typically or was it just kind of writing in general? I guess it was always writing in general, though I definitely was into the spookier things in life. I actually recently chronicled my long-standing relationship with horror in a poem called Halloween Poem and it was featured on the Heavy Feather Review last October. tI’ve definitely been expanding to other genres and I recently wrote a romance novel. I’ve been trying my hand with a few other genres like short story form as well, but horror is definitely something I come back to. You get this question a lot but it’s worth mentioning: who are some strong influences for you? So I guess you know Stephen King would be the obvious one of course, but there’s this movie from the eighties called Killer Klowns from Outer Space and it made me incredibly happy. I actually just recently re-watched it and I still absolutely love it. That reveals a lot about you, Lucas [laughter]. There is a lot of stuff that I like that isn’t, you know, spooky. I also like stuff that has a sense of humor as well. I’ve only recently started to incorporate more of a sense of humor into my work. Indeed, a lot of my stuff tends more towards the bleak side of things but some of the last few pieces I’ve done have been–I don’t want to say lighter–but definitely there has been a bit more humor providing some comic relief. So all your different writings, are they pretty much stand-alone pieces or are there connections between the stuff you’ve written? You know I often toy with the idea of tying them all together but the idea of trying to compile an expansive work like the Labyrinth stories or JRR Tolkien’s work is really intimidating for me. But I kind of end up doing it on the subconscious level anyway you know, coming from my head of course these stories exist in some sort of connected way I would imagine. So you don’t intentionally do that. Now that you’re older [you’re still young], but if you could think back as far as you can when you first started writing, what would you tell that younger Lucas about writing? I’m tempted to tell him to get a bit more serious about learning the craft a little earlier but at the same time I don’t think I really regret anything. So I don’t know, maybe I’ll leave time traveling to the guy from Quantum Leap then. So you’re probably more of a process-oriented person. And having no regrets is also a good thing. I don’t recommend some of the choices I made but I don’t regret them either. After your first work was published, did that change things for you in terms of the way that you carried out your process? After that I started second-guessing myself a little bit more. I thought it was a pretty good novel but I sort of built it up in my mind so much that I started thinking that I’d never be able to repeat that success. What is one of the novels that people should know about? That’s easy. Come Closer by Sara Gran is absolutely frightening. It’s about a woman who may be possessed, and it’s all told in first-person from her point of view. You kind of get the impression that there’s a chance she might not be possessed and that she is just kind of losing her mind. I don’t know the author managed to capture that in such a visceral way but it had an impact on me. How do you balance asking the reader to do something and also caring for the reader? How does that factor into your process? I mean it definitely used to. I guess when you’re a new writer you really do get concerned about the notes you have to hit in this particular genre. I don’t know, now I kind of feel like if I’m having fun running with a piece, regardless of what I do with the genre’s tropes, I think that will show through and hopefully the reader will have fun in turn. Now that you are a published author, obviously you are hitting a different stride. How do you define success? I mean, success is such a weird word, because there is such a thing as commercial success or monetary success. But as a writer in general, how do you view success? Is it about your own personal satisfaction? When you write, do you do research at all, and if you do, how much time would you say you spend on that? Yeah, I mean I guess it really depends on the project. If I’m writing an intense, personal piece then all the research I need is already there in my life experiences. But if I’m doing something in another time period or something that involves, I don’t know, police work or something, I’ll have to do some actual research. I guess the short answer is it really depends on the project. Has most of your work been more personal and so it doesn’t require as much research? For someone my age I think I’ve actually experienced quite a bit of things. I’ve got this well that I can draw from without doing a tremendous amount of research. Now, you mentioned that you do have this really strong energy to write. On average, how many hours a day are you writing? You know, I don’t usually count in hours. I shoot for a minimum of 800 words a day but usually I end up doing anywhere from 1500 to 2500 words a day. Looking over the synopsis of some of your short stories and other stuff you done, I’m intrigued by whether you tend to focus on different periods in life, like childhood, adolescence, or early adulthood. A lot of times I do end up focusing on the present, though I’ve definitely written all over the place; I have kind of been all over the map as far as stages of life go. I haven’t done much about the elderly, so maybe that’s my next novel. Those of us with interesting vocations like writing or acting or religious work tend to be less commercially successful in many ways, though we put a lot of work, energy, and passion and love into it. Do you think that writing for you is a spiritual practice? And I give you full freedom to define spiritual however you wish. Yes, I mean, at the risk of sounding corny or something like that, I really don’t think ideas come out of thin air. I think all artists are definitely channeling something. I don’t know if that’s humanity’s collective unconscious or chaos or something else. I don’t really think that is for me to say. But I think you would imagine a story is coming from somewhere and life experiences are only a piece of the puzzle. You’re in a type of zone when you write and you almost kind of have to hypnotize yourself into getting into that place because otherwise you know you’re worried about making a mistake or doing the dishes or paying your rent or whatever. And if you’re focused on something like that then you’re not going to be able to bring it and put it on the page. Certain elements of isolation can be good if we were able to break free from some of those day-to-day routines and get into that creative space, one many people have compared to meditation in other spiritual practices. Definitely. I usually spend a tremendous amount of time meditating on what I want my first line to be because for some reason that first line is like a doorway. Once I get that first line down I can pretty much just go. It is interesting, but that’s how I used to write song lyrics back in my early twenties and then I kind of got away from that practice when I started writing prose. But then about 6 months ago I started reincorporating that practice into my prose and it’s actually worked out really well. I did something like a hundred and fifty thousand words during last year. Let’s talk about Engines of Ruin, the collection of stories. They all look really interesting. Were there particular stories in that group that really just came easy for you? Yeah, Occupy Babylon was probably the easiest one. And, in the case of Ghost Music, I got the idea, I had a title in my head for a while, I didn’t really have a story. Once I got a story idea I was actually writing it on my phone. At the time I was walking to class and I just basically wrote the whole thing on the phone, during these trips to class. So there there was an immediacy to it—to get the idea to the page quickly instead of filing it away in my brain, which you know can be hazardous because if you file it away like that by the time you sit down and write it you may not see it as that exciting to you anymore. I’ve got to get it on the page, even if it’s just a few sentences or just a general outline of the idea. This seems to further my enthusiasm for the project, so I can maintain it over the course of writing. Were there other stories in this collection that were actually more of a slow burn, you know, in terms of getting them done? Video Inferno, I guess. I wrote the first draft in about a week and then it took me four years of really poking at it to get it into the form that it is now. I went through so many revisions. It’s a very surreal story, so when you’re playing with the surrealism, on the surface what you know is happening might not make sense. That requires a little bit more calculation and attention to detail. What were some of your favorite characters in these stories? Definitely the rock star. I mean, I’ve entertained becoming a rock star at least once in my life. Also, the bartending preacher. Actually, this came out of a conversation I had with somebody. She was somebody I used to work with at a previous job. She was like a fundamentalist or whatever and she said it would be a total fall from grace if a preacher were you know, to quit his job and start bartending. I actually disagreed with her because I thought, you know, being a bartender is almost like being a preacher. You mention that The Last Easy Rider is more of a manifesto than a story? That goes back to the spiritual question you asked earlier. Basically, the main character is a version of me who is driving in this beat up camper van, you know, across the American highways, and encountering ghosts and demons and other shady characters. I thought it was essentially an interesting metaphor for me navigating my subconscious, even down to the van. Let’s shift to your new book, We Are the Accused. I was reading through the synopsis and wow–there’s some interesting stuff there. I also wonder what didn’t make the final manuscript. Were there certain things you had to edit out? Yeah, it just had a lot of characters and a subplot to glue together in the initial draft. Then I got further along and I didn’t think that they fit together as much as I would have liked them to. So I ended up deleting 20,000 words, more or less, in the original work. How do you feel when you delete that much? It was difficult. I mean, there’s definitely a sense of loss or a grieving process involved. But I should say that I deleted it from the manuscript but I still have the text available; I didn’t destroy them forever. How do you select names for characters? Usually friends. Specifically for this one I just went through my Facebook friends and picked out names I thought were interesting. I would take some person’s first name and another person’s last name and combine them for one character. Any significance to the setting, Blue Brook, Pennsylvania? Yes, it’s basically Bristol Township and Bensalem with a little bit of Levittown, but all is one town. I think even Doylestown gets a mention in this book. Do you have any hidden secrets that only a few people will catch? Of course, yeah, definitely. I’ll put stuff in there that will be there for people to catch. There’s this character in Gods of the Dark Web, and one of my friends called me immediately after reading it as and was just like: “Oh, thanks for turning me into a [devious character] in the book.” Sorry. I’m sure that was a great phone call. So how long did it take you to write this novel? The first half of the novel took me a ridiculously long time, like I’m talking a year-and-a-half just writing the first half. It was because I was going back and rewriting and fixing things as I went along. And because I was able to write the first half in this way, the second half was quick and pretty much set up for me; I didn’t really need to second-guess myself at all. What do you hope the readers will experience when they read this and what type of journey do you hope they go on? I hope they have fun, first and foremost. I hope that some readers will maybe, you know, look a little deeper into it and hopefully notice the spiritual questions raised in the book and the social ones as well. I think if you know what you’re looking for you’ll find it and I would hope that people would kind of read beyond the surface. In your work you often include a sense that each individual has a darkness inside, for lack of a better term, and that this darkness manifests itself outside. It’s a universal idea, right? We have the sort of Yin and Yang thing inside of us: light and dark. Do your characters tend to constantly live in that struggle or is there any sort of resolution, or better said, a realization of that struggle? I mean, my work does sometimes end on a hopeful note, though the more recent book might be considered a tragedy, but there are certainly moments of revelation. Thanks, Lucas, this had been great. Anything else to add about We Are the Accused? It’s out on January 15th and on Kindle as well. I believe the paperback will be along shortly after that. Interested in checking out Lucas’ new novel? Click HERE. I’m no expert on demons, evil spirits, or whatever you wish to call them. I like Hellboy a lot, but he’s kind of an anti-demon + anti-hero, wouldn’t you say? In fact, I should probably go to my friend and amazing author, Lucas Mangum. Flesh and Fire just might help set some context as to how demons are presented in literature [both religious on secular]. Maybe Lucas will even chime in! Lucas, are you down there in the comments? Anyway, this Luke Gospel story is about a bunch of demons. Jesus steps onto gentile territory and he is met immediately by a demon-possessed man. He is called a man of the city, like the woman of the city with the alabaster jar whose tears washed Jesus’ feet in the previous Luke story. He doesn’t have a home, he doesn’t even have clothes. The people of his community even tied him up in shackles. They bound him to try to control him. Jesus, however, approaches him and commands the oppressive spirits to leave the man. Jesus sees him as a human being. But the man is tensed up and yells at Jesus to leave him alone. When Jesus asks him his name, he is able to get out: Legion. This name makes sense, because a legion of demons was oppressing him. Apparently, the demons are reasonably smart and have thought things through; they have considered their options. The abyss? Not such a great place for demons to have a summer home. The abyss, in ancient Judaism, was a place where evil spirits were tormented. So yeah…no. So the demons beg Jesus to let them escape into some nearby pigs that were minding their own business. Jesus agrees and the demons enter the pigs and the poor animals rush down the steep bank of the lake and drown. Obviously, this is not good news for the guys who work with the pigs. Can you imagine? They were eye witnesses. There they are, minding their own business, when their pigs start going crazy like lemmings and run down the lake’s bank to their death. I imagine that they were ticked off. Which is great for the story, because their anger moves them to run off and tell a bunch of people. Meanwhile, the once-bound and oppressed man is now sitting at the feet of Jesus [just like the lady with the alabaster jar], and now he has clothes on and his sane. But the people of the town don’t celebrate; instead, they are afraid and tell Jesus to get the Galilee out of town. The newly healed man, demon-free man wants to go with Jesus, but Jesus tells him to stay in his town and tell everyone what happened. I’ll get right to it. I’m not one who believes in demons or evil spirits—at least not the kind with horns and not the ones who make people’s heads turn in complete circles or spit out green fluid. I like reading about them in stories and comics, because I do think they point us to the real thing. That “real thing” is evil, or the personification of evil, and the way that evil can bind and oppress a person, a family, a community, etc. We have no clue as to what really afflicted this guy Gentile territory. Was it his past? Did he suffer abuse of some kind? Was it a chemical imbalance, addiction, what was it? I think Luke doesn’t say for a reason. The point is that he was afflicted by a myriad of things, so take your pick; put yourself in his shoes; put other people you know in his shoes. The first thing that stands out to me is that any kind of afflicted person is still a human being—even if people tie that person up, declare the person untouchable and even inhuman. The other thing that I notice is that not only was this man untouchable and marginalized, but the evil spirits themselves ended up in pigs, another untouchable, unclean living thing, at least for the Jews of that time. Remember, Jesus was in Gentile territory. Poor pigs. And yet, in light of the recent horrific and tragic events in Orlando, Florida [and the sad, ignorant and hateful responses to it by politicians and others], I am going in this direction: you see, we seem to be able to talk about people who have drug or food or gambling addictions; it’s commonplace to talk about people who are bound by an abusive past. But how often do we admit to how many people are bound by prejudice? How many people have evil in their thoughts and worldviews, so much so, that they are willing to hurt others who are different than they are, using hateful words, bullying them, or even resorting to violence? It’s happening too often. And we rarely talk about it. Many of us have family members or friends who are clearly prejudiced against certain people. Gay? Lesbian? Transgender? Non-binary? Black, Asian, Latin American, African, Eastern European, Arab, Spanish-speaker, Atheist, Arabic speaker, Muslim? They are afflicted, they are bound by their prejudice. Some of it is a result of social conditioning. Maybe they were raised to hate a certain group of people. Perhaps they went along with their peers in school just to fit in. Or maybe at work it was just easier to put down the person who was different. Whatever the case, prejudice is evil. It is affliction. It binds people. I, as many other people, I am tired of prayers for families of victims of hate crimes. I’m tired and angry. I’m not saying that prayers don’t matter. I AM saying that prayers are not enough and that sometimes we hide behind them. It’s easier to say we’re praying for the families and victims in Orlando; it’s a lot harder to actually do something about the prejudice and hatred in our own communities, families, schools, and churches. We live in a world in which is easy to spread hatred via social media with one click and a thousand shares. But it’s equally easy to do the opposite—to combat hatred and to cooperate, love, and embrace pluralism of all kinds. Churches pray, but what do churches do? I’m tired of all kinds of prejudice, including subtle prejudice and all the excuses that we continue to make as to why we won’t stand up and say enough is enough! Why we won’t be more courageous in our communities and risk upsetting relationships with friends, classmates, work colleagues, church friends, and even family. Our inaction binds us. Evil happens and we stand silent. Jesus healed this seemingly untouchable, non-human. But then the newly-restored man was then told to tell the scared and prejudiced people of his town what God had done. What God had done. My take is that whether you believe in this god or not,there is a universal theme here. Everyone deserves to be treated like a human. People will make categories and draw border lines and spread hateful rhetoric to keep us separated. They do that because they gain something from it [usually money and power]. But we can’t make excuses anymore. It’s time to admit to the prejudice that binds us as individuals and communities. The moment is NOW to stand up against your family members, friends, or co-workers who spread hate to others. Unfold your hands, open your eyes, and actually do something. Spread humanity. Spread cooperation. Spread love and acceptance. Teaser for next week: Luke 9:51-62: Is it difficult sometimes for you to move on from your past? How can we stop looking back so much and move forward? Side note: to all my friends and family and colleagues who identify as Lesbian, Gay, Transgender, or Non-Binary—I love you and I’m angry, too. I pledge to do my best to stand up against hatred and prejudice. My prayers will be my actions. And the same goes for all my Muslim friends and colleagues. Love you, too. I stand with you.